We lived in Lucrino, outside Naples, for nearly a year. It wasn’t the best of apartments. Built into a hill, only the living room and kitchen had windows, not the bedrooms. No heat or ventilation. In winter the cold was intense; guests wore coats to dinner and I wrote wrapped in wool while mildew slowly blackened our plaster walls. The summer steamed. But the terrace in front of us looked over the lovely and mysterious Lago Averno you see in the picture. 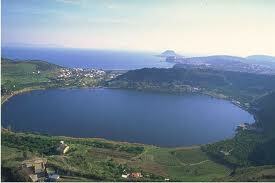 It was crater of an ancient volcano, still so toxic in Roman times that birds avoided its waters. So Lago Averno was clearly the entrance to the underworld. Virgil thought so. Temples to Jupiter and Apollo were here and wealthy Romans built magnificent summer villas on the gentle hills. It is believed to be the most archaeologically rich zone of Italy. Dig anywhere, they say, and you will find something. I never did but builders routinely turned over treasures. Unfortunately, the lake is now rimmed with discotheques owned by shady elements. On weekend nights, the circling road, in the 90’s at least, was lined with gently rocking cars whose windows were covered with newspaper to hide the heavily occupied couples inside. Housing is expensive and most dating couples lived with parents. Hence the assignations in cars. But we digress. You can visit the temples, the remains of the villas and museums bursting with marble, frescos, delicate glass vases, golden jewelry, mosaics, ivory — enough to re-create a buried world. Now we live in East Tennessee where diggings turn up even older treasures. Recent road work at further east uncovered a sinkhole full of Miocene creatures now in Gray Fossil Museum: a red panda, rhinos, saber toothed tigers, camels, short-faced bear, shovel tusked elephants, sloths, hippos, extinct beavers and three-toed horses. I just heard about this museum today from my friend Doris Gove, naturalist and gifted interpreter of the natural world (see her books in the link). I remembered Lago Averno and how it glimmered beyond our terrace.